May cherish up against some lonely hour." From Opening quotation of Renfro Valley Keepsake souvenir program / book; published by Renfro Valley Enterprises, Inc. 1940. Jerry and Sky - A popular native New England duo that often saw publicity promoting their 'roots' in Tennessee. As one local Boston reporter noted, "The Tennessee Hillbillys have become adopted Bostonians." The studio broadcasts over WHDH often had 30 or 40 people in the audience. When the duo broke up, one ended up with his own all night radio show, Jerry Howard which included a couple of his popular characters. The other Schuyler (Sky) Snow joined the Dale Carnegie organization. KCUL Cowtown Hoedown - Over the years, we have discovered many of the old shows and to this day, are discovering more through our research. Due to a recent contact, we thought we would feature one of those old programs to change it up a bit - the Cowtown Hoedown out of the Majestic Theatre in Fort Worth, Texas. It may have competed with other more famous shows in that era, but it was part of something unique in country music history - the 'live' broadcasts of entertainment. Arlie Kinkade - It is time to start to shine a light on some of the early writers, authors, journalists, reporters that documented early country music happenings for future generations of researchers and writers to draw upon. He wrote for Orville and Jenny Via's "National Hillbilly News" publication. John Lair started fans collecting song lyrics in the old WLS Standby; Arlie continued it with a publication called the "Song Exchange News" that led to Country Song Roundup continuing that tradition by including an insert of lyrics in each issue. He was also a one-armed fiddle player, read on. Don Lunn - Don Lunn was one of the first performers on the KCUL Cowtown Hoedown in Fort Worth, Texas. This was during an era when hillbilly music was thriving in many such shows. Don got to share the stage with many of the stars. 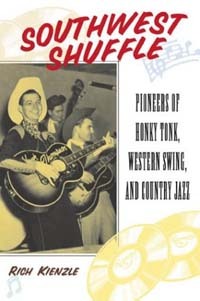 One reviewer said that "...the spirit of Hank Williams lives still in the voice of Don Lunn, boy troubadour." He later left behind music as a career to join his family's business that spanned several generations. Mitchell Sisters - One cannot marvel at the close harmony singing from a brother or sister duo. The Mitchell Sisters were two friends that were next door neighbors in their teen years as they began their musical efforts. The girls designed their own stage outfits; their tailor was Nudie. They were part of the Rockford Hayloft Jamboree and the WAVY Tidewater Jamboree. When they were on the East coast, they often paired up with Tommy Riddle's band. They also appeared on the WRVA Old Dominion Barn Dance. Don Owens - Don was a disc jockey who gained a following in the shadow of the nation's capital. He worked at stations in Baltimore and Silver Spring, Maryland as well as several stations in Arlington, Virginia. He was a songwriter. One of his records was produced by Jack Clement when he was still on the East coast. Don's career lasted nine years; he died in an auto accident. Mary Randolph - Mary was part of the Iowa Barn Dance Frolic as well as the Renfro Valley Barn Dance. A few of her friends also shared memories of her. Old over the air recordings of her 5:45am show over WHO survived to collectors. She was also the featured vocalist on one of the USAF Country Music Time broadcasts. This biography was originally written in 2006 and is sure to be updated in the coming weeks. Jesse Rogers - A cousin of America's Blue Yodeler, Jimmie Rodgers. He made a name for himself in his own right. He grew up in Mississippi, married at an early age, but he wanted to pursue a musical career. He moved to Texas, began performing on the radio and at various venues. Even worked at a border radio station in Mexico (XERA) and made dozens of recordings for the Bluebird label. Later divorced his wife, re-married and migrated to the Kansas City area. Moved around to St. Louis then finally to the Philadelphia area where he gained fame on the WFIL Hayloft Hoedown and his own shows. 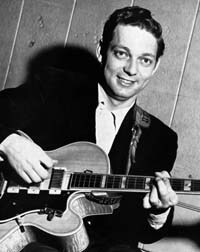 Bob Williams - Bob's band was the Cumblerland Mountaineers. He was a native of Kentucky. We were fortunate to hear from the wife of one of Delbert Williams, the steel player for the group and Gene Mullican who also played steel for the group at one time. Read about the comedian of the group Joe Binglehead. Bob's career took him to Nashville for a time as well as West Virginia and Virginia. 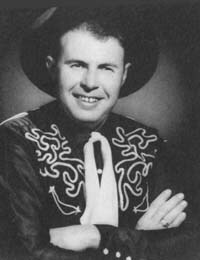 Ralph Wrinkle - The Singing Sheriff as he was known was part of the KLWT Saturday Night Barn Dance in the late 1940s. The June Carter and her Family would be guests on this show to further broaden their listening audience. Ralph later moved to Hobbs, New Mexico. He was elected Lea County Sheriff in 1973. He became friends with Wally Fowler and for many years, teamed up to do benefits to bring attention and to and fight child abuse as well as appear on the Gospel Music shows Fowler put on in Lea County. Dusty Owens - Dusty tells us about his career in his own words. He contacted us out of the blue years ago and became a good friend over the years. Work has begun on Chapter 3 of his biography, where he often said "that's when it all halppened." The way you remember it! 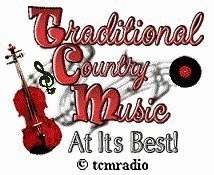 Keep clicking around - there's always something new spopping up on Hillbilly-Music.com. The country music you like to hear is always just a click away every day. Just click on one of the show titles to visit their site. Give a listen. Kick back and enjoy the music. And send them a note of 'thanks' too while you're at it!